Just how close does Huawei’s MateBook 13 match Apple’s MacBook Air? Huawei wants to play in the big leagues when it comes to notebooks, unleashing its MateBook 13 as the rival to Apple’s MacBook Air. But how do they stack up against one another when put to the test? Huawei has long modelled its devices on those of Apple. Now it’s unveiled a laptop aimed at taking on Apple’s latest MacBook Air. Huawei’s MateBook 13 looks a lot like the MacBook Air. It has the same aluminium housing and weighs around the same at 1.28kg. There’s less of an edge around the keyboard, and the screen diagonal at 33.02cm is slightly smaller than on the Air. The display resolution doesn’t quite match the Air’s Retina display. Both offer good keyboards, with a preference between the two likely to come down to personal taste. The trackpad of the MateBook is a bit smaller and elongated, and, like many input surfaces in Windows notebooks, reacts a little more skittishly to barely perceived touches. Both devices have a fingerprint sensor. In terms of processing power, the MateBook is slightly ahead. While the Air comes with an Intel DualCore i5 processor and an Intel UHD graphics chip as standard, the MateBook offers the latest eighth-generation Intel Core i5 or i7 chips with four cores and a Nvidia GeForce graphics chip. The Air is equipped with two Thunderbolt 3 ports in USB-C format in addition to the headphone jack, while the MateBook has two USB-C ports. However, only the one on the left carries a charge, which makes things rather confusing and awkward. The Air is not so picky and carries power over all of its connections. When it comes to battery life, the Air has the edge. It claims up to 12 hours of wireless web surfing and up to 13 hours of video playback while the MateBook claims video playback of only 10 hours. The biggest difference lies in the software. Here the question is Windows or macOS? The MateBook 13 comes with the Windows 10 home edition preinstalled, including the Edge browser. However, some of the preinstalled programs may not be met with enthusiasm by all users, including games such as “Candy Crush” and “Township,” and the Xing and LinkedIn professional networks. The Apple device avoids such bloatware. However, Huawei’s own software offers some useful features, such as the new Share 3.0 that, like Apple’s Airplay, offers a quick and wireless way to share videos, photos and files – provided an up-to-date Huawei device is to hand. 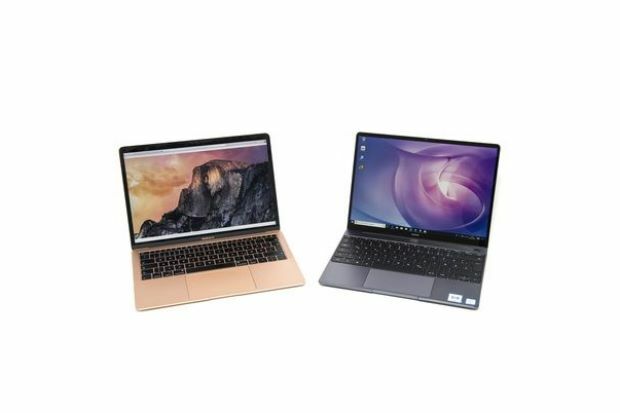 If you like to work with Windows 10 and are looking for a portable device to use on the go, Huawei offers a good choice with the MateBook 13. However, die-hard Mac users will be harder to convince. After all, the Air has the advantage of a Retina display and a longer battery life. In price terms the MateBook is ahead, with the Core i5 version retailing at US$999 (RM4,042), while the MacBook Air with a Retina displays costs US$1,199 (RM4,851).